Thallus: foliose, medium-sized, 5-20 cm in diam., adnate lobes: +crisped and elongate (1-2 cm wide and up to 4 cm long), imbricate or separate; tips: rounded to subtruncate, often ascending and undulate upper surface: blue-gray to brown when dry, blackish green when wet, smooth, shiny, with often phyllidiate margins, without isidia and soredia medulla: white, with +loosely interwoven hyphae photobiont: Nostoc lower surface: white, with brownish to blackening, smooth, flattened and reticulate veins, rhizinate rhizines: brown to black, irregular, bushy or fasciculate branched, at base of the lobes Apothecia: rare, +round to oblong, becoming saddle-shaped, on rather long, ascending lobes, up to 8 mm in diam. ; margin: smooth to crenulate disc: reddish to dark brown, smooth ascospores: colorless to pale brown, acicular, 3(-5) septate, 50-70 x 3-5 µm Pycnidia: not seen Spot tests: all negative Secondary metabolites: tenuiorin, methyl gyrophate, gyrophoric acid, + 7α-acetoxyhopan-22-ol, hopane-15α-acetoxyhopan-22-ol, hopane-6 α,22-diol and unidentified terpenoids. Substrate and ecology: among mosses over soil and detritus at intermediate to relatively high elevations World distribution: temperate and boreal regions of North America, Europe and Asia Sonoran distribution: Arizona, southern California, and Sinaloa. 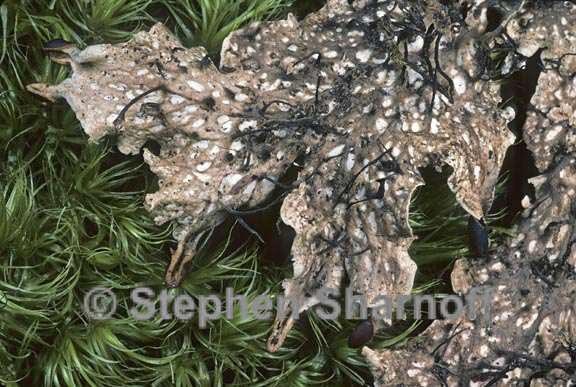 Notes: Peltigera polydactylon is distinguished from other glossy, non-tomentose taxa by its crisped margins and its rather long apothecial stalks, as well as its flat network of veins, that are brownish pigmented marginally, and its dense, brown to black, branched tufts of rhizines.